I’ve started a project. Over the seven months, I’m reading books that fall under the heading of Global Historical Fiction…which is to say novels that deal with issues of politics, history, and nationality. I’m doing this partly because I love novels that deal with these themes, but also because it will provide good research for my own writing. My aesthetic has always been for novels that, at heart, question nationality and the role of politics in our everyday lives. The pitfall, I think, is to write about these issues without becoming overtly didactic. Fiction, after all, (in the words of Philip Roth) is the exploration of private lives. 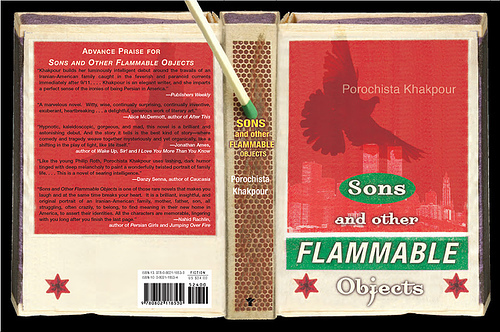 And perhaps that’s what Porochista Khakpour does best in her debut novel, Sons and Other Flammable Objects (Grove Press, 2007). Her characters are, above all, vividly imagined. 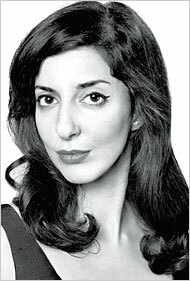 Khakpour doesn’t rely on stereotypes and caricatures to paint them. You don’t see them drinking tea from samovars, sprawling on rugs, or exploring the metaphorical possibilities of saffron. They are not Iranian characters; they are characters that happen to be Iranian, which is not to say that race and nationality are not an important part of this novel. While the conflicts are familiar ones: father versus son, wife versus husband, cultural preservation versus assimilation, etc., Khakpour’s masterful handling of them is fresh. The novel follows the trials of the Adam (pronounced Odd-damn) family who relocated to southern California (an apartment complex allegorically named Eden Gardens) from post-revolutionary Iran. The major conflict is between father (Darius) and Son (Xerxes), and seemingly stems from two incidents—one dramatized, the other recounted—with birds. In the novel’s humorous exposition, Darius is confronted by an angry neighbor who accuses him of belling the complex’s cats in order to save the blue jays. Years later, Xerxes recalls that incident while living in post 9/11 New York, asking for an explanation. Instead, Darius confesses a far darker secret about being a child in Iran and setting fire to doves. The confession divides father and son. As each man struggles to come to terms with his own depression and anger, the women in their lives carefully orchestrate their lives. Susanne, whom Xerxes meets after 9/11, eventually persuades him to face his fear and visit Iran, while Laleh persuades her husband to swallow his pride and communicate with his son. While some might interpret the incidents with the birds as the crux of the problem between father and son, it would be more useful to pay close attention to Khakpour’s details: the Fruity Peebles and I Dream of Jeannieinfatuation…the small New York apartment and desirability of hardwood floors. It’s through these details that Khakpour carefully portrays cultural and familial conflict and saves her characters from abstraction. Khakpour’s style is certainly experimental. She writes fragmented sentences heavy with adverbs and liberally switches between points of view…reading her work is like going joyriding down a rocky mountainside. She splits words open and looks for their multiplicity of meanings. She translates words and customs from the Farsi with both eerie and hilarious effects. It’s thrilling and demanding work, but Khakpour makes it all worth it. Announcing the Winner of the 2007 Wabash Prize in Poetry! !